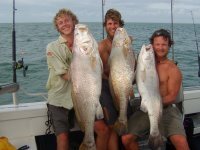 Enjoy Barramundi Fishing with one of the many experienced fishing guides in Darwin. The dry season saltwater fishing is an opportunity to fish the coastal islands, harbours and rivers for barramundi and saltwater reef fish. For keen fishermen there is nothing like the metre-plus barra that are caught in the Top End waters. Barramundi Fishing is a popular recreation sport all around the north of Australia, and particularly in the Top End coastline and rivers near Darwin. And no wonder, if you like fishing at all there is nothing more exciting than landing a big, fighting Barra or three. Barra is also farmed to supply chef's with it's succulent meat to use in their favourite Barramundi recipe, and no doubt the thought of the evening meal is why there are such big grins on anglers faces in so many of the fishing photo's we see. There are lots of different ways to catch a barramundi because they are found in so many different habitats, moving between freshwater and salt water with the seasons and their life cycle. Their activity increases with the warmer temperatures from September to March and catch rates are generally higher then as a result. Perhaps the best time is the build up to the monsoons during October, November and December when they are feeding aggressively while preparing to spawn. Some tips on catching barramundi in the wet season. Anything that lives in or around water, including insects, prawns, spiders, prawns, or fish is fair game for barra, so they will take lures, live bait or fly's. They can find prey at night and in muddy water by sensing vibration, so moving lures or live bait are usually most successful. Some of the best fishing is in the big rivers where netting has been banned. These include the Roper, Mary, Daly, McArthur and Adelaide Rivers. There are plenty of other good fishing waters too, including the Finniss, Victoria, Towns, Robinson, Wearyan, Calvert and Keep Rivers. In Kakadu National Park, the South and East Alligator Rivers are known for good fishing.There are so many anglers trying to catch barramundi in the Top End that it has become an important part of the tourist industry. 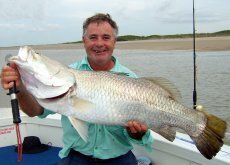 As a result there are plenty of professional barramundi fishing guides, tackle stores, boat ramps and fishing accommodation catering for this popular sport. 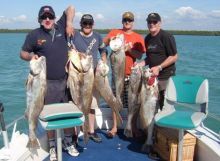 If you have you own transport and your own boat any of these areas can provide a fishing adventure, but many barramundi are caught from Darwin's wharves and foreshores with the simplest of hand lines. A good catch often depends on being in exactly the right spot at the right time and the local knowledge of the professional fishing guides can be invaluable. If you are staying in Darwin the local fishing clubs are also a good source if information on local conditions at any particular time. Saltwater fishing at it's best.